Simulation Technology for Radiation Safety Training. By using the SIM-Teq training system, instructors are able to enhance or completely remove the need for the use of real radioactive sources during training exercises. Instead, trainers have unprecedented flexibility to choose when, where, and how they want to train. SIM-Teq is a wirelessly interconnected system composed of a variety of simulated radiation detection instruments, simulated gamma/beta sources, and support hardware all controlled and configured using a simple, intuitive software application running on any Windows 10 based PC or tablet. Through an innovative mix of manual and automatic control capability, the SIM-Teq system enables training instructors to create a realistic training environment which includes high fidelity simulated instruments and “live” detectable sources. This unique combination of capabilities allows the instructor the freedom to teach, observe, and assess trainees while retaining the ability to remotely manage or control any SIM-Teq device at any time. The system is designed to meet the variety of training organization needs allowing frequent, realistic training that provides trainees with the skills necessary to successfully accomplish their roles. 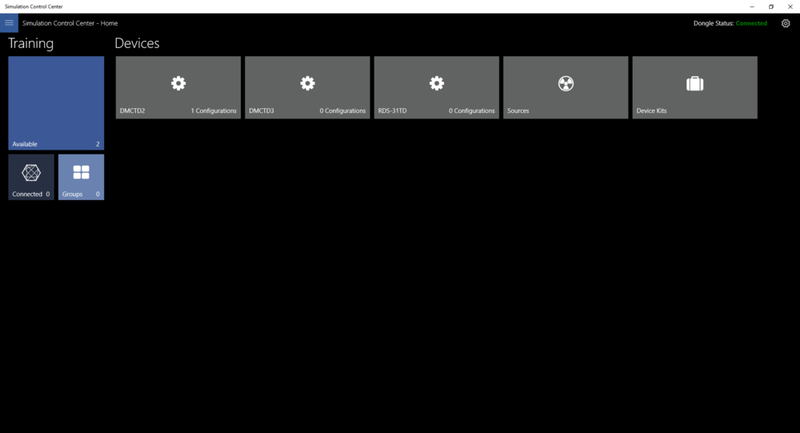 Simulation Control Center (SCC) is a Windows Store application that serves as the SIM-Teq system control hub, allowing users to wirelessly monitor, manage and, control all SIM-Teq training products. SCC is designed to run on a Windows 10 tablet or PC. SCC communicates with the various system devices through a dedicated USB Dongle. The combination of application and dongle allows for configuration, manual control, and monitoring of one or more devices. SCC enables the instructor to swap between auto-response and manual control of all features and functions supported by each connected training device. SCC supports up to thirty-two (32) connected training devices at one time. In addition, SCC allows the user to update SIM-Teq product firmware. The Two Way Ranging Source simulates a "live" source of gamma radiation. SIM-Teq training instruments fitted with Two Way Ranging circuitry continually measure the distance from one or more sources and adjust the reported dose rate using the inverse square law. Each source is physically identical, small and easy to conceal, and suited for indoor and outdoor use. Source activity levels is adjustable from 1 mR/hr to 99,000 R/hr, as measured one foot from the source. TWR Sources can be deployed individually or in a group. SIM-Teq training instruments simulate Original Equipment Manufacturer (OEM) portable survey meters and electronic dosimeters. Each training product uses OEM factory parts in their construction to provide the same form factor, display, audible indicators, switches, fault and alarm features, response variability and operating functionality as the real instrument. In most cases, all features and functions of the original instrument are replicated. All SIM-Teq instruments allow for manual or automatic dose rate input either natively or through the addition of a Rad Tag. Copyright © 2019 Radiation Safety & Control Services, Inc. All rights reserved.